Researching possible origins and theoretical roots of Sound Sculpture and Sound Art it isn’t rare to get to face the oeuvre of Jesuit priest Athanasius Kircher, an intriguing character who has been a point of reference for the work of many artists. We will here attempt to get closer to his poetics and understand which are the elements in his research that foremost might have influenced aforementioned fields. Athanasius Kircher, the younger of nine brothers, was born on 2nd of May 1601 in Geisa, (near Fulda) Germany. His father, Johann Kircher, doctor/professor in philosophy an theology and an amateur musician, gets him to approach music. He joins the Jesuit Order in 1618 and attends their school in Pateborn. Then, from 1629 he is in Wurzburg university, Professor in philosophy, maths and oriental languages. Kircher is in Rome in 1638, when he is appointed Professor in mathematics, physics and Oriental Languages at the Collegio Romano. In 1651 he founds the famous Collegio Romano Muesum. 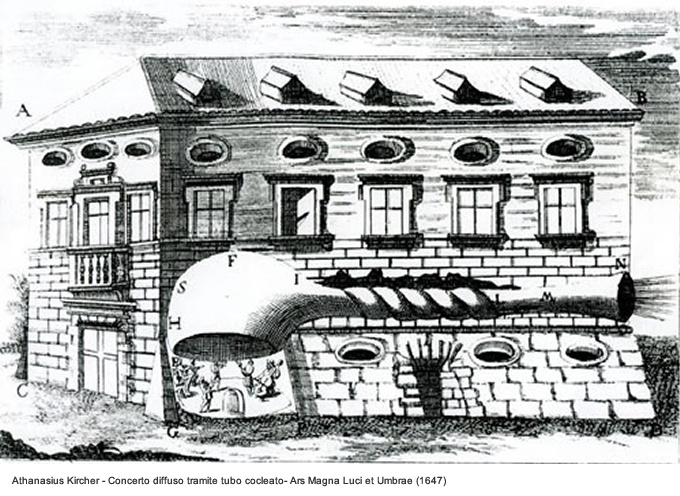 father Athanasius chamber of wonders anticipated modern science museums, since it taught whilst entertaining through extravagant experiments and continuously referring to images.” (Lo Sardo, Eugenio., “Athanasius Kircher. Il museo del mondo”, Roma, De Luca editions, 2001, p. 15). He always remains in Rome except from occasional travels around Italy and to Malta, between 1636 and 1637. He dies in Rome on the 27th of November, 1680. Athanasius Kircher‘s oeuvre is distributed within forty printed-books and over two thousands manuscripts and letters. His most important book concerning music is the “Musurgia Universalis” (1650), although important sections concerning designing of musical instruments and illusionistic machines can be found in many other works: “Magnes sive De Arte Magnetica” (1641) “Ars Magna Lucis et Umbrae” (1646), “Ars Magna Sciendi” (1669) and especially “Phonurgia Nova” (1673), the latter being entirely concerning nature and features of sound and acoustics. The “Musurgia Universalis”, an encyclopaedia-size work composed by ten books divided in two tomes of 1152 pages altogether. The works begins from an investigation on ‘natural’ sound and voice physiology (book I), proceeding to speculations about the origins of music (Book II) and focusing in the III and IV books, on theoretical conjectures about harmonic science. The V book concerns music theory, whilst the VI is about musical instruments. In the VII book the brightest example of Baroque’s “theory of affection” of which Kircher is one of the most relevant theorists. He states, for instance, that music can affect people differently, depending on each individual’s mood. To endorse his own theory he makes experiments on the vibration property in different liquids (considered as moods) poured in five chalices set on a table(AA.VV., “The Great Art of Knowing. The Baroque Encyclopedia of Athanasius Kircher” Edited by Daniel Stolzenberg, Stanford University Libraries, 2001, ed. Cadmo, 2001, p. 74). We will tackle the eighth book in detail later. In the IX the claimed power music has on people, healing from diseases including tarantula’s bite and plague. The X book contains an example of Baroque’s concept of the spheres’ harmony, in which the symbolism of numbers and mathematical theory of harmonic proportions result to be tightly bound to the philosophical enquiry about origins and order of the Universe. Kircher asserts that the world’s structure is determined by a balance between all beings, harmonized with each other by a God seen as a supreme organist (img.1). However, the one section beino more useful for research is book VIII, where is show a new metodo of composing which Kircher christens De Musurgia Mirifica (the translation could be Marvellous Art of forging Music), based on combinatory art’s rules and comprising the only vocal music field as a matter of fact. Starting from a chosen piece of poetry he aims to put in music, the Composer must begin a series of calculations and operations which will lead him to get the final piece. In order to achieve this, special four voices chord voices are used; these Tabellae melotacticae follow the figured bass rule, both for the contrappuntus simplex and the contrappunctus floridus (where the melody/ies summed to the given chant, present different rhythmical values). Each one of those includes sequences set to be adapted to particular poetic meters called Mutarihmi consisting in sets of figures disposed on four lines. Each chord corresponds to a syllable in the text that has to be put in music. In the Musarithmus the melodic line is read from right to left and the harmonic one from bottom to top, whereas the four horizontal lines refer to the vocal harmony’s four parts: bass, tenor, alto and contralto. In the Tabellae melotacticae boards, together with the Musarithmi are further rhythmical structures based on binary and ternary times that can be applied to any notes sequence. To put in music the chosen verses it is hence necessary to assemble a sequence of ciphered chords, namely a series of Musarithms, which are to be transcribed on the staff until the whole text is over (Chierotti, Carlo, Mario., “La Musurgia Universalis di Athanasius Kircher”, see original article on www.chierotti.net p.1). 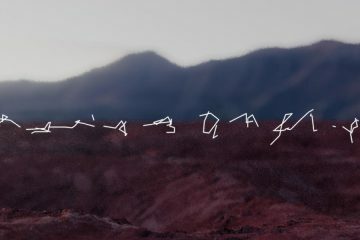 It is plain clear how it can be captivating for a contemporary artist, to be confronting such a method applied to computerized systems. 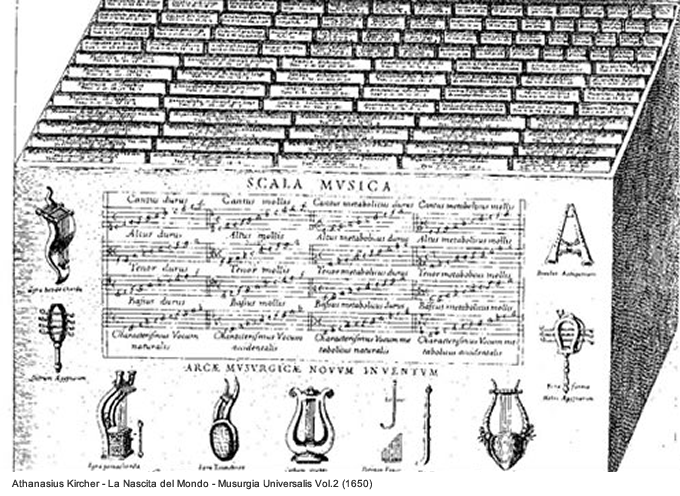 The “De Musurgia Mirifica” basing itself on combinations and chords boards, prepared sequences and rhythmical structures devised to be put in sequence, could be interpreted as a forerunner of digital composition. Sound sampling and the use of rhythmic pattern and frequency modulators used in audio editing could well fit to be studied and compared to such system of composing. 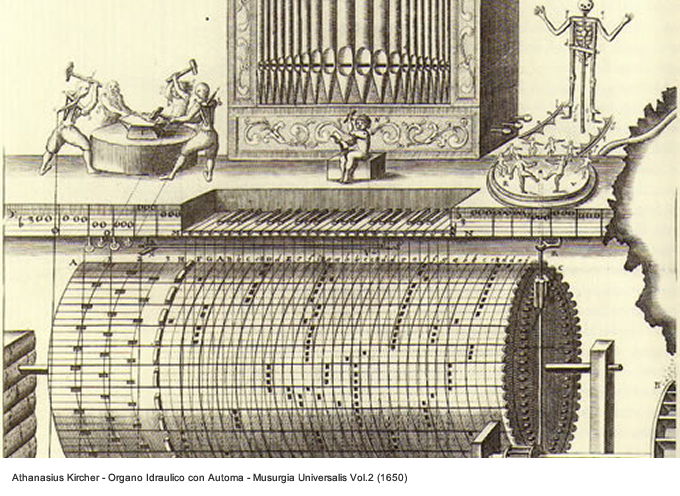 What’s most remarkable in Sound Sculpture is however the composing machine, the Arca Musarithmica of which functioning Kircher talks about in the last fourteen pages of Book VIII. It is not actully a real “machine”, yet more similar to some kind of “basic computer” (AA.VV.., “Humans, are they really necessary? In The wire. Adventure in modern music”, issue 186, august, 1999, p. 24). A box in which samples of compatible-to-phrases Musarithmi are set. “The machine was way smaller than what I thought, not a large box but a tiny mahogany one, not larger than a book, with an oblique section closed by a hinge under which a small glass label was fixed. On the side was written ATHANASII KIRCHERI MUSURGIA, on the front face ABACUS TONORUM and below MIXTURA TONORUM. On the back ABACUS CONTRAPUNCTIONIS. Writings indicating that that hence was a device for musical calculation. However, the mentioned “inside”, was made inaccessible by that glass label fixed over it: “I could see from outside that there were seventy-seven small sliding panels of which sizes varied between one centimeters and two and a half.” (Haakman, Anton., “Il mondo sotterraneo di Athanasius Kircher” -“De onderaardse wereld van Athanasius Kircher”- Milano, ed. Garzanti, 1995. p. 154). We can think of the Arca Musarithmica as a device halfway between a sculpture and a musical instrument. A mysterious object standing on a line of research that runs through the designing of automatons and mechanisms and gets to Luigi Russolo’s Intonarumori and Macel Duchamp’s A Bruit Secret. 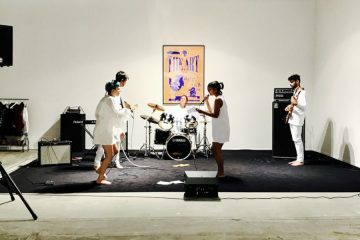 This suggestion leads us to imagine a connection between the works of artists as for instance Jean Tinguely, Harry Bertoia and the Baschet brothers. Some of the instruments designed by Kircher are remarkably beautiful, seeming to be oscillating between science and dream, like the peculiar Arpa Eolica [Aeolian Harp n.d.t.] and a Organo Idraulico con Automa [Hydraulic Organ with Automaton] (For deepening see Thomas, L. Hankins and Robert, J. Silverman., “The Aeolian harp and the Romantic Quest of Nature”, in Intruments and Immagination, Princeton, Princeton University Press, 1995). Athanasius Kircher has perfect knowledge of classic Greek and Latin texts from which he gets inspiration for his experiments on sound and mechanical devices making. He is especially keen on Erone d’Alessandria’s works (Ist cent. a.c) who had invented, among other things, water clocks, pneumatic organs and other mechanical music devices. 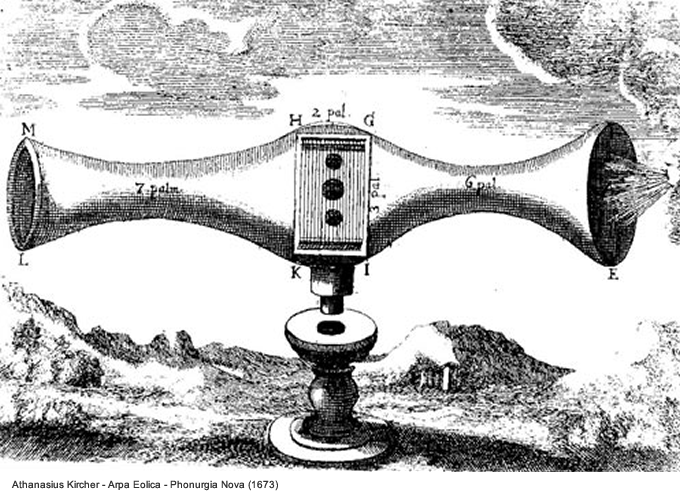 Kircher refers to that in his Phonurgia, were he contemplates the properties of transmission of horns’ sound. He employs such systems to generate amazing effects, like making statues talk in the Delphic Sibyl and Talking Statue cases. “Later in time I was asked to move my private Museum in a wider and appropriate place in the Collegio Romano, the one they call the gallery. The pipe I previously mentioned was moved there too, and can now be admired and heard under the name of Delphic Sibyl, with the consequent difference: the pipe, previously transmitting distant loudspoken words, now act secretly through facetious oracles and false consultations with a muffled voice, therefore nobody notices anything about the secret techniques of this whispered dialogue. And at the very time it is shown to strangers who do not understand the way the machine works, it is not rare that some get to believe in a manifestation of the Devil himself, since the statue opens and closes its mouth and moves its mouth.” (AA.VV.., “The great art of knowing”. Op. Cit. p. 228). 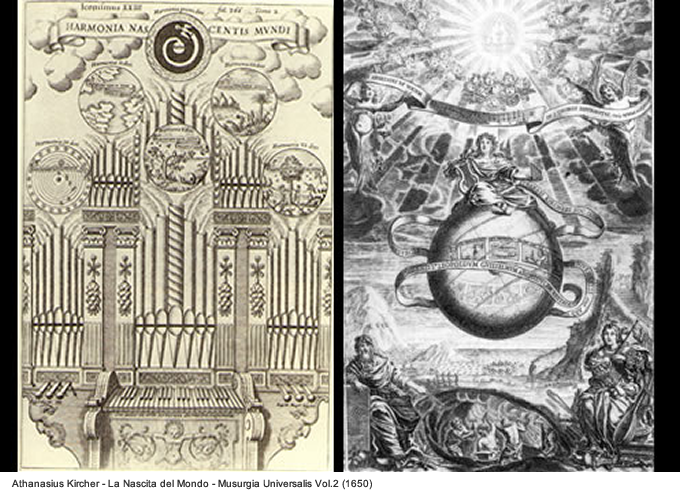 Kircher aims to arise wonders effects of artificial magic, namely the art or ability to produce something marvelous through human work, making use of diverse instruments for a decadent wealthy class in lack of principles and moral. The machines achieve a primary role in the flourishing Baroque culture of special effects and water setup fountains. He indeed did design many machines and devices. A full cataloguing and analysis of his creations was given to us by two of his disciples. In 1657 Kapar Scott publishes the “Mechanica Idraulica-Pneumatica” a thorough description of the hydraulic and pneumatic devices in the museum. In 1678 Giorgio di Sepi “Kircher’s assistant in devices’ realization”, edits the first catalogue of the Museum Kircherianum were a complete list can be found. If we take under consideration one of the base elements of Sound Art, namely the relation between space and sound, in relation with who perceives dimensions through listening, some of the devices Kircher created are of relevant interest. Through a system of sound transmission that makes use of pipes and elliptic-shaped architectural constructions, Kircher connects buildings and rooms, broadcasting musics and sounds from one room to another. The applications of that are by him described in the “Ars Magna Lucis et Umbrae”(1646; Book X, IIIrd part, metamorphosis I, II and III). He, figures the possibility to connect two buildings in order to, for instance, allow two princes to secretly communicate while staying in separate rooms. “Between two rooms of arbitrary width, create a space of 100ft or more, then realize within such space enclosed between two walls an acoustic ellipse making the two focal points in both rooms coincide with a small window placed there for this aim. The words uttered by the prince standing near window B, even though being whispered, will be heard by the other prince standing by window C as clearly as if the two of them were standing next to each other” (“Ars Magna Lucis et Umbrae”, Book I, p. 99-101). In man of such projects sound diffusion is employed unger service of amazement and magica fascination for the spectator. 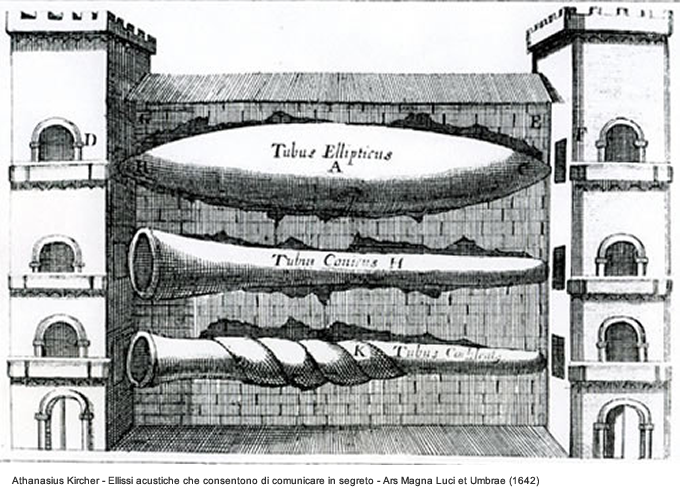 Kircher explains how “to makò possibile that a delicate concert of voices and instruments of any kind is hearable within the range of tao or tare miles, so that nobody could fathom its suore”(“Ars Magna Lucis et Umbrae”, Book I, p. 143-144). An operation of this kind requires the express construction of a secret room inside the palace “of a curious prince”. The room must be built using chalk, its surface being concave as a sphere and it must have a secret door and a window in order to enlighten the ambient. The room will then be put in communication with the outside through a pipe which constitutes the extension of the hemispheric vault. It is then necessary to position the end hole of this in a predetermined, usually quite crowded location. The musicians hidden in the room begin to play. Sound grows thank to the reverberation of intensity and the only direction it can go is through the pipe, thus being diffused through the aperture. “Al those in the area around couldn’t help to be bewildered and amazed hearing this prodigious music, wondering wether the source of such melodic polyphony would be on earth or heaven.” (“Ars Magna Lucis et Umbrae” Quote). At this point we can identify in the sound spatialization realized by Kircher as well as in his way of employing it in order to put the individual in relation with space, a believable connection with some of the specific features of Sound Art. Thinking for example about Max Neuhause projects Water Whistle Series (realized between 1971 and 1974), the feature both accosting and of fascination for the spectator, who is in the situation of listening to sound while being soaked in water, directly recalls the stupor raised by the Kircher’s articulated acoustic structures. 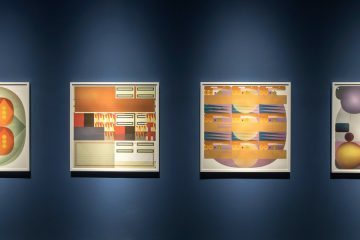 In some of Christina Kubish installations, as for example Five Fields (2002), we can see how the spectator is directed within the environment not just by sight, but chiefly by perceiving different diapason sounds in the very space. He is pervaded by ultraviolet light, which modifies the room’s boundaries, and feels disorientated and stricken by a sense of dizziness. 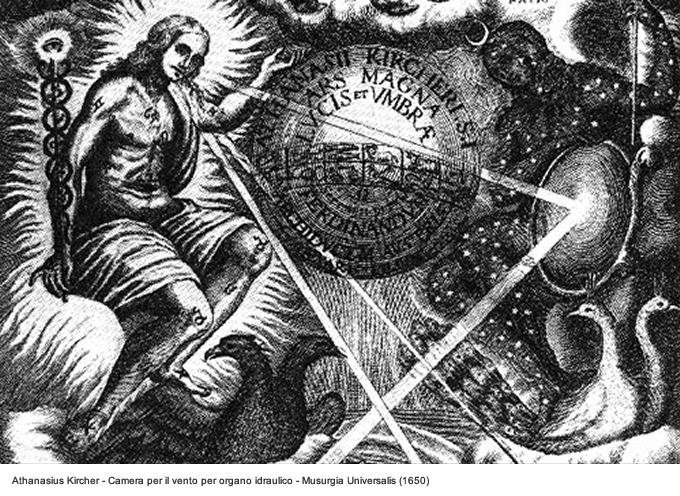 We can recognize influences by Athanasius Kircher work in many artists’ projects. An example of this being the Italian exhibition dedicated to him, Sonorità prospettiche: suono, ambiente e immagine [Perspectival sonorities: sound, environment and image], showed in Rimini in 1982, where Sound Art projects about the relationship between environment and sound were displayed. There are in the exhibition some of Max Eastley drafts for the Biddick Art Farm Center in Washington, in which he puts forward a system of devices activated by wind. PVC flutes and a few Aeolian Harp that through their natural forms do indeed show similarities with the Jesuit’s instruments and are surely affected by the charm of those. Alvin Lucier’s Solarimini is the project for an installation based on sounds which vary depending on atmospheric conditions, through the implementation of a small solar panel in a room. Equally interesting are Albert Mayr’s graphical scores for his performance Signals from the harbor [Segnali dal porto] in which the rhythm of the two sound-articulated signals (the harbor’s lighthouse and the fog lamp) spreads over the urban territory demarcating many different areas of audibility as many performers there are. Max Neuhaus presents a project for the metropolitan passage Montparnasse-Bienvenue in Paris. 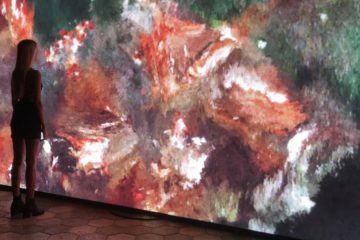 He explains how his sound installations wield the environment itself, to achieve a re-definition of the space they are in, generating auditory topographies. The sources of sound are concealed, thus sounds become a natural element of the very space. Music with Spheres [Musica con sfere] by Terry Riley, instead, is a performance interpreted by musicians, who operate with a quadriphonic diffusion of sound in a room with loudspeakers positioned on the ceiling and directed by dancing performers. Karlheinz Stockhausen’s unrealized project Tunnel-Spiral is puts forward the creation of a sound-tunnel in the shape of a composition. The placement of loudspeakers which emit sounds with predetermined delays depends on the time needed to pass through the tunnel. That creates the temporal and rhythmical subdivision in the composition. Christina Kubish’s The Bird Tree, is presented in the shape of a tree, on which several electric cables are tangled. These are connected to a number power amplifiers which are attached to recorders that broadcast bird calls. Lastly, the Windscube by Leif Brush, shows the realization of a sound-cube inside which a tree grows. This structure is set by the side of several kinds sensors and electronic translators and it interacts with natural events such as rain, snow and wind (AA.VV.., “Sonorità prospettiche: suono, ambiente e immagine”, catalogue by Franco Masotti, Rimini, Il Comune editions, 1982). 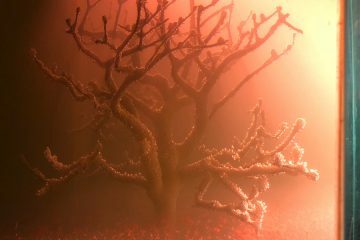 At this point becomes spontaneous to search through the displayed projects and look for poetic similarities with Kircher’s theoretical works, especially about attempts to put in connections the techno-machinary feature with nature through the use of sound. From that, dynamics of relations arise, generating bewilderment and stupor in the spectator experiencing the artwork. 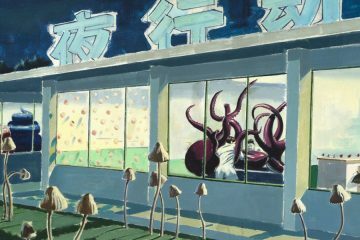 Can thus be compared to miniaturized artificial universes, which transmit cryptical messages from a playful creator.” (Op. quote). His creative sensitivity, continuously merging with magic, puts him to be in the same relationship there is between an artist and his work. For instance, in his imaginary worlds angels and daemons overlap and live within marvelous events. Watching them we are cached by the will to believe, to be completely be spectators. Convince ourselves that we are witnessing pure mystery and eventually see the trick be unveiled and be equally amazed. The magician is the one able to make others dream new possible universes. In the very same way in which an artist unveils his creation in front of our eyes, Kircher as “nature magician” allows us to deeply get in relation with our vision of the world. Looking at his drawings we are caught by doubt and curiosity. Can we pronounce Kircher a proper artist? The answer to this question will remain indefinite and is this very blurriness that charms and stimulates us. The presence in his works of both scientific will and sense of magic introduces us in a dimension most similar to the one in which we find ourselves today watching a piece of art. Furthermore, to use sound as pivotal point of the illusory game, in order to arise emotional effects among the public and at the same time to exasperate its mathematical aspects, bringing the composition on the level of pure combinatory calculations underlining a continuous tension, visible in each one of his machines and mechanical instruments. Maybe we are re-reading (and re-watching, especially) Kircher exactly because of this tension that has never been put together again and perceive him as the more contemporary of our ancestors and the less present of our . This same unsettlement can be the reason to be, still nowadays, fed by the artists that have turned to him in the constant research on sound and the relationships it has with the environment, men and space.